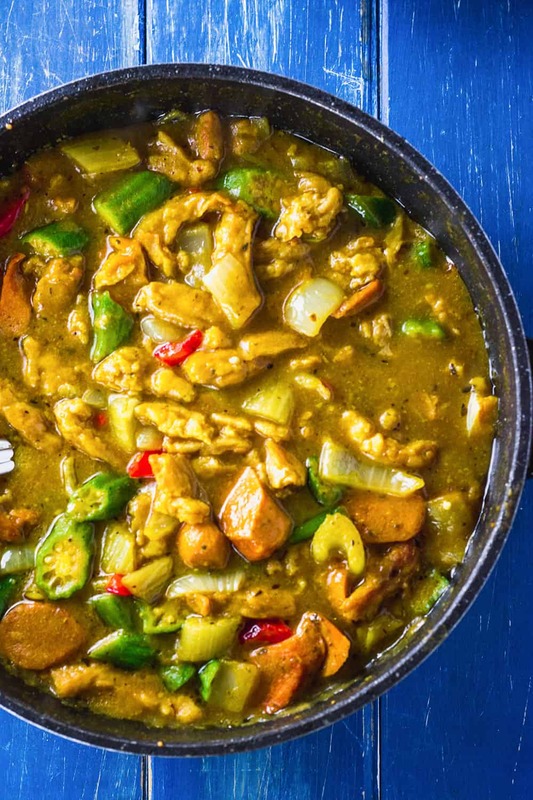 This amazing Vegan Gumbo Recipe is my new family favorite recipe and we just can't get enough of it. It will definitely be your family's favorite! My vegan gumbo recipe, kind of reminds me of my Smothered Tofu recipe, but with the addition of veggies along with protein and more flavor components. To make this recipe, I was first inspired by my friend Adrienne who was born in New Orleans and she shared a photo of her version of the original dish. Her photo had chicken and sausage from what I recognize and looking at the photo inspired me to create a vegan version. I knew with the over 500 percent of people transitioning to a vegan diet, that many of them from areas here in the south are still craving for their favorite dishes and wondering how they could still enjoy the flavors and the textures. 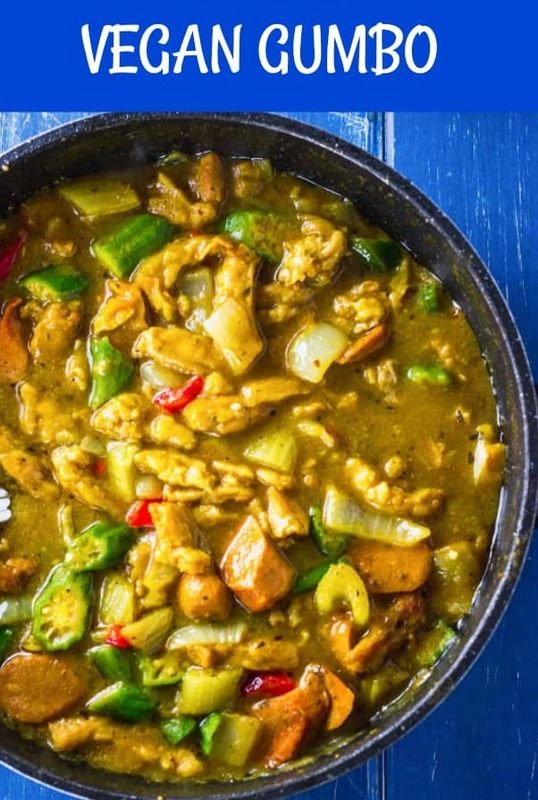 So this vegan gumbo recipe is dedicated to all my transitioning vegan readers and those who are seasoned and are looking to try something new that's full of flavor and just mind-blowing. For that reason, I chose to use Soy Curls to replicate the chicken and Tofu Pups to replace the sausage. You can substitute seasoned jackfruit that is first baked for the chicken or any of the vegan chicken on the market or even tofu cubes. You can substitute with the many vegan sausages that are on the market, this one looks very promising. I'm also gluten-free that's why I used Tofu Pups plus that is what I had on hand. For those who are vegan but not gluten-free, these Field Roast Sausages are one of the best on the market and they are popular here in the USA that even Walmart carries them. This recipe is so flavorful that it will be the most forgiving, so you could even use beans instead. 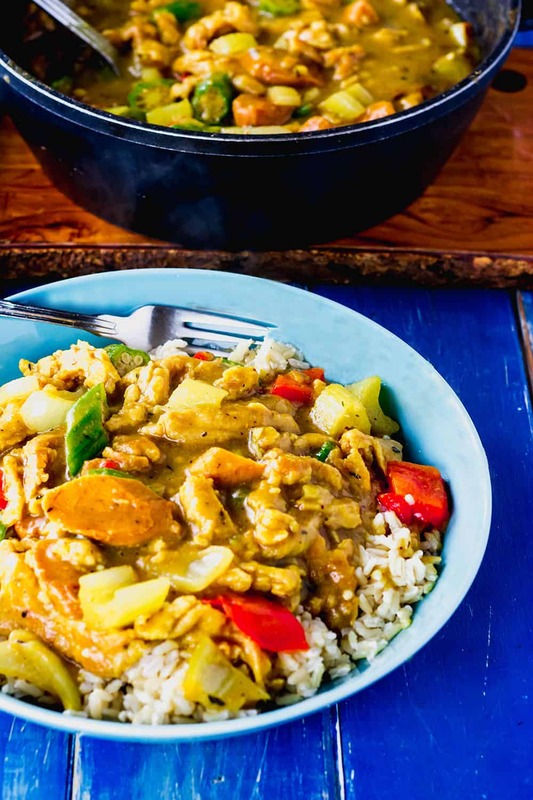 Vegan gumbo is simple to make but the flavor is mind-blowing! 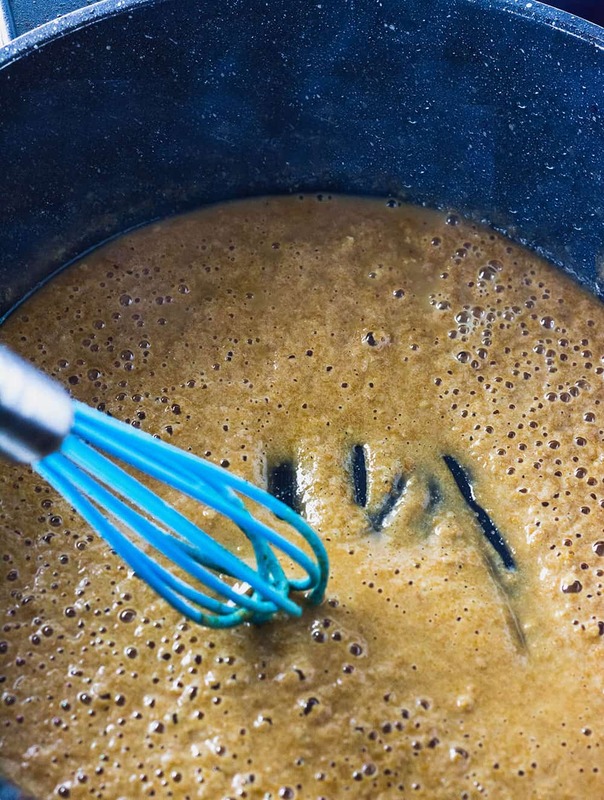 I first made a roux using gluten-free flour and olive oil. This is the most technical part of making the dish and the rest is easy peasy. I used vegetable bouillon plus water to make my vegetable broth, some great ones online here or check at your local health food store. You can substitute vegetable broth. I used fresh okra, but you could substitute with frozen. Oh yes, I just remembered that I also made my own Creole seasoning, so you can either use store bought or try my recipe below. Preheat oven 400 degrees F. Drain soy curls and toss with Bragg's liquid aminos, onion powder, garlic in a large bowl. Transfer to a parchment lined a baking sheet that is lightly greased and bake for 25 minutes turning halfway or until soy curls are crisp on the edges and golden brown. Meanwhile, prepare the roux. Heat oil over medium heat in a large saucepan, add flour and stir to prevent clumping. Keep stirring constantly and cook for about 10 minutes or until roux is brown. 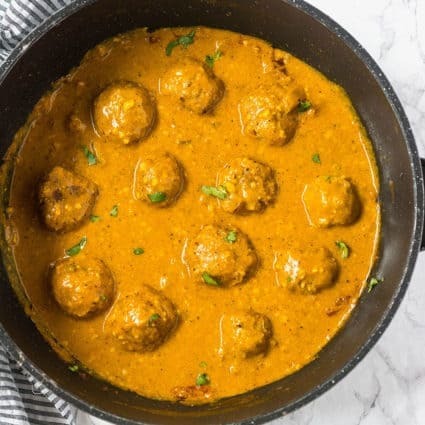 Once you have achieved that brown color, add the yeast flakes, onion, garlic, celery, bell pepper, green onion and cook for about 5 minutes stirring constantly. Stir in vegetable broth, diced tomatoes, Creole seasoning, thyme, parsley, basil, cayenne pepper, and bay leaf. Bring to boil stirring, allow to thicken and for flavors to blend, about 10 minutes. Meanwhile, lightly saute chopped sausages in a skillet until brown. Add okra, sausage, and soy curls to the base and cook for 10 more minutes or until okra is tender. Delicious served over brown rice. Combine dry seasoning in a ball jar with a tight fitting lid. I haven’t yet prepared this but had to comment on the photo. As someone with family throughout all of New Orleans and have had many vegan gumbo dishes, this is honestly the very first with the correct color. All of the others were red which is no way synonymous with Gumbo. I will absolutely be trying this out very soon, thanks so much ! Oh wow Gina, thank you very much. I appreciate your feedback, from my research most of the other traditional dishes represented seem to have seafood in them. I would love to veganize more and I would love your feedback on which recipes you would love for me to convert. I had regular Gumbo before and this was so much better. Very good recipe. I will make this recipe again. That’s wonderful to hear Evan, I’m so happy you enjoyed it. Thank you for your feedback. This recipe is beyond amazing! Thanks so much for sharing such amazing ideas. You’re super creative! Hello Tiffany, I’m so excited that you find it beyond amazing. Thank you for your feedback. 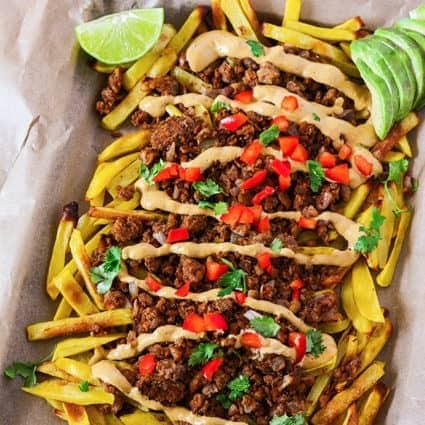 I was wondering if I could switch the soy curls with seitan? Can you tell me more about these soy curls? Never was a big chicken fan. Can they be flavored to imitate beef or pork?? I looked on the website and all I found was chicken flavoring…I have not worked with this type of product in many years, but would like to. Mainly I rely on Morningstar-type prepared meat-subs. now. Thank you! JoceK, soy curls is a whole organic soybean product with no additional ingredients so it is way better than Morningstar products which use isolated soy proteins that are highly processed. Yes, it can imitate the flavors that you want by the seasonings you add to it. The main thing is you soak the soy curls, then add Bragg’s liquid aminos, onion powder, garlic powder, Italian seasoning. Bake at 400 degrees F for about 30 minutes turning halfway. Then you proceed like you would in making beef or pork.Hope this helps. Healthier Steps, you did it again! There isn’t one of your recipes that I don’t love. Thank you for all your delicious recipes. Aww Felicia, thank you for your kind words. I really appreciate it! Can I use tofu … and if so, do I prepare like the soy curls? Also, can I use better than bouillon seafood seasoning instead of vegetable? Maria that will work great with the tofu instead of soy curls. Wow, I can’t wait to get my hand on better than bouillion seafood seasoning. I hope you enjoy.